57th day of the year. There were then 308 days left in 2019.
on the 9th week of 2019 (using US standard week number calculation). 68th day of Winter. There were 22 days left till Spring. There are no major holidays or observances in the United States for this date. 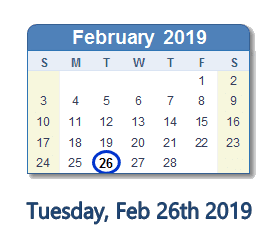 What happened on February 26th 2019?